Jack and I are en vacance and I had a moment to update you on some completed and gifted projects. 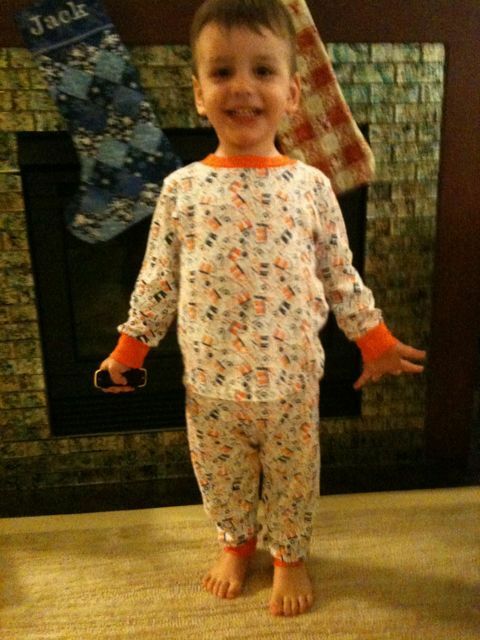 The second set of PJ’s were a hit, Jack’s and Baby Haley’s. Here are some fuzzy snaps. I couldn’t get really great pictures with these ever-moving targets! It’s a slightly darker (brighter?) 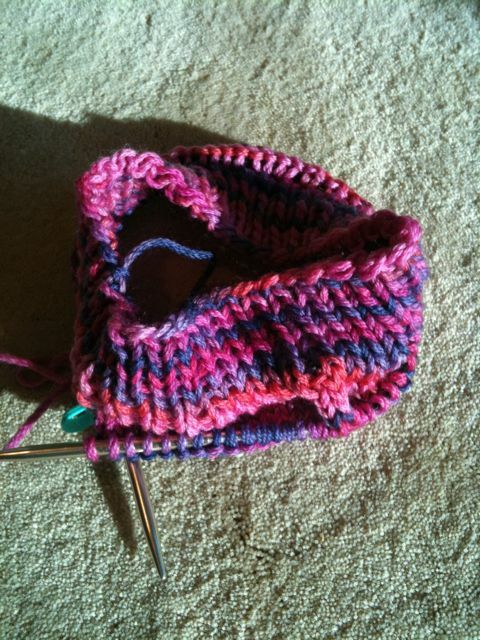 colorway than the other hat/mittens. 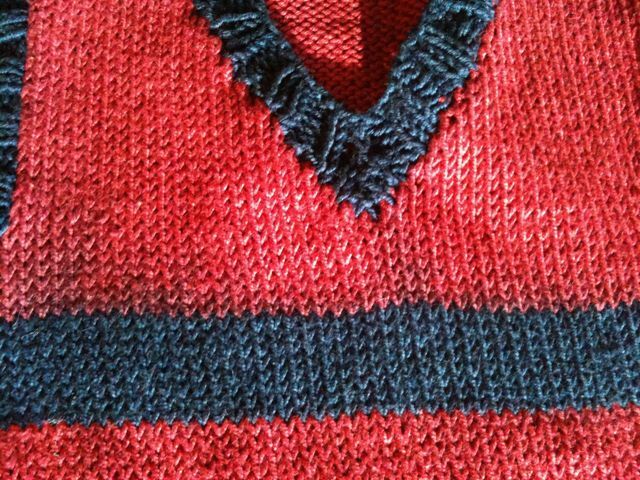 In other knitting news, I washed Jack’s 2009 Xmas sweater and there was serious damage done. I washed it in cold, with little agitation, and air-dried it. When I looked at it after the sweater had dried, I noticed that the blues had bled into the burgundy areas. I have no idea if this sweater can be saved now. Any thoughts on this from other knitters out there? It’s a cotton and supposedly washable yarn. In sewing news, I have to confess to going through major sewing withdrawals right now. I am seriously jonesing for some fabric in my hands and to hear the whir of my sewing machine. I can’t wait to get home and get started on a project for me. ME. MEEEEEEEE!!!!!! I think I’m jumping on the Selfish Seamstress train here. I want to only make things for me for a while. Happy knitting and sewing to all of you who can do so right now. I’m jealous! 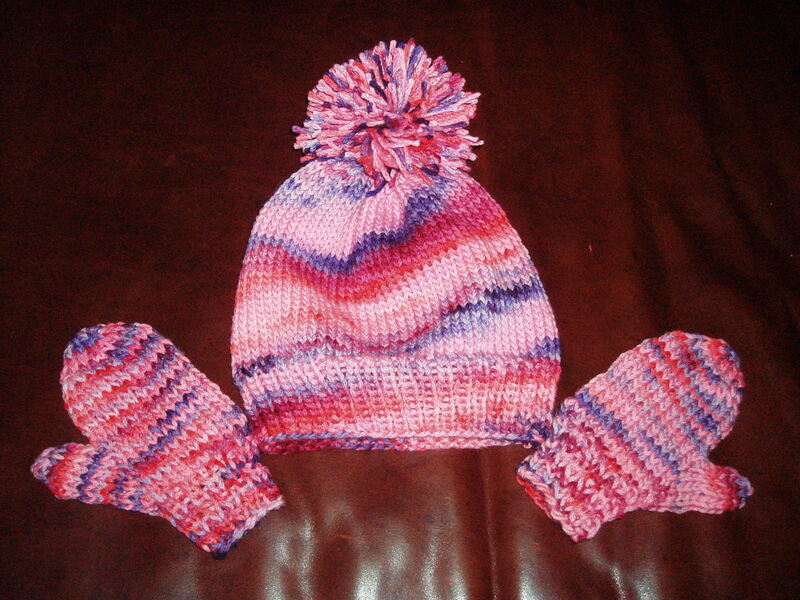 This entry was posted in Beginner, Crafting for others, Gifts, Knitting, Kwik Sew, Sewing. Bookmark the permalink. How terrible about the sweater! If it’s any consolation, the bleed doesn’t seem that noticeable. You might try washing it again with a “color catcher” cloth. i also bought some special detergent from Dharma Trading that is supposed to wash out extra dye. I haven’t tried it because I finally accepted that the project I bought it to save was completely ruined. So I feel your pain.